The largest antique fair in California, this monthly market offers unique, vintage items from over 800 sellers as well as picturesque views of San Francisco bay. Alameda requires all their vendors to only sell items that are at least 20 years old, ensuring that you won’t have to sift through a bunch of stalls selling “dollar store merchandise.” Don’t forget to wear layers, it can get chilly and windy, but it’s worth it once you see the great antiques Alameda has to offer. 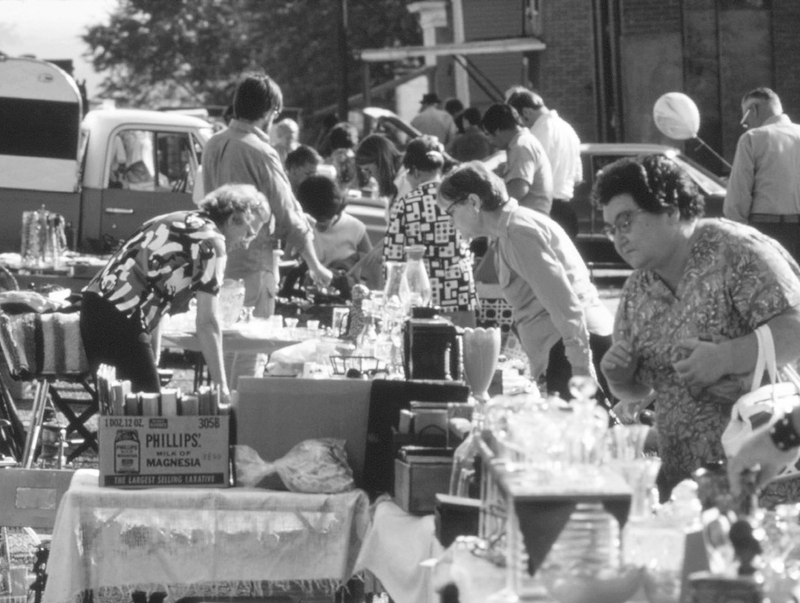 The largest flea market in the country, Brimfield Antiques Show runs three times a year in May, July, and September. Covering twelve fields and stretching many miles along Route 20 in south-central Massachusetts, this epic market hosts over 6,000 antique dealers selling all sorts of forgotten gems. Take a break from the beach at this impressively scaled Florida flea market. The Daytona Flea Market is open weekly and spans 30-acres, boasting over 800 vendors. Along with chatchkes, souvenirs, and homewares, this market offers a great sampling of local food such as honey, pickles, and jams along with fresh produce from local farms. This is a market not so much for serious antiquing but instead for a wide variety new and used items, great food and fun for the whole family. Tucked away in New Milford, CT, Elephant’s Trunk is a treasure trove or antiques and vintage furniture. Open since 1979, what started as a small lot with a few vendors has grown into a massive 55-acre market. You may recognize Elephant’s Trunk from HGTV’s Flea Market Flip, where contestants are tasked with finding a beaten up item and transforming it into a unique piece. With a little digging, you’re sure to find some great pieces on any trip to Elephant’s Trunk. Every Sunday year round, the Fremont district in Seattle hosts a lively market featuring one-of-a-kind vintage finds, work by local makers, delicious food, crafts, and more. Beyond just shopping, a mix of entertainment is usually on show from Seattle’s creative and eccentric crowd. Come hungry and enjoy the best food trucks Seattle has to offer while you shop. On the last weekend of each month, Randolph Street Market opens their doors to Chicagoans eager to find unique housewares and other treasures. This European style indoor-outdoor flea market is considered the best in the area and is complete with a year-round fancy food market and beer garden in the summer months. Visit Randolph Street to shop great vintage clothing, jewelry, and ephemera, and stay for the live entertainment, food, and drink. Situated around the iconic stadium in Pasadena, the Rose Bowl flea market is the most impressive and expansive flea market in the LA area. Open monthly, Rose Bowl Flea Market has something for everyone, from vintage cut-offs, work from local artists, high-end antiques, and cheap treasures. A popular spot to find hippy-inspired, vintage threads, and mid-century antiques, don’t miss this unique shopping experience the next time you’re in LA.